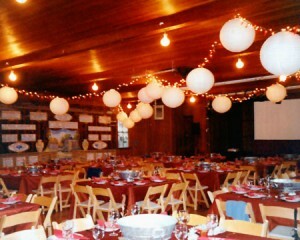 Centrally located just five minutes from both Calistoga and St. Helena on Highway 29, the Tucker Farm Center offers a unique historic setting for all of your special events and gatherings. NOTICE: We currently are not accepting applications for private events that include live entertainment, bands, DJ’s, or recorded and amplified sound during development of new guidelines for use of our facility. We apologize for any inconvenience, please check back in the future for additional updates. Thank you for your interest in TFC! If you wish to host a fundraiser or other event that requires admission, ticket sales, donations and/or sales of alcoholic beverages, an ABC license is required. This historic building echos with the voices, music, songs and laughter of decades of human activity and it is waiting to share in your special moments and memories as well.